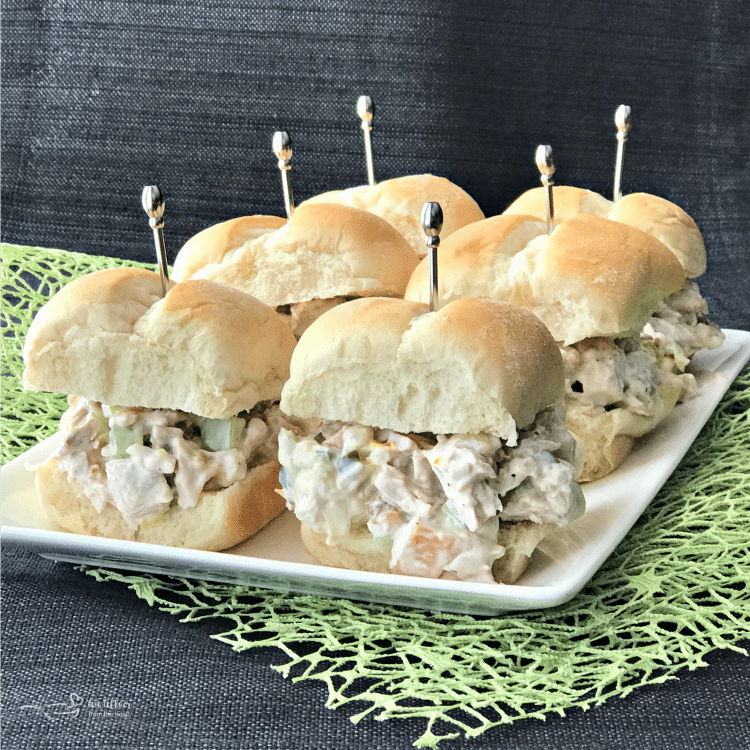 Turkey Salad Sliders- A Simple Recipe for using leftover turkey. 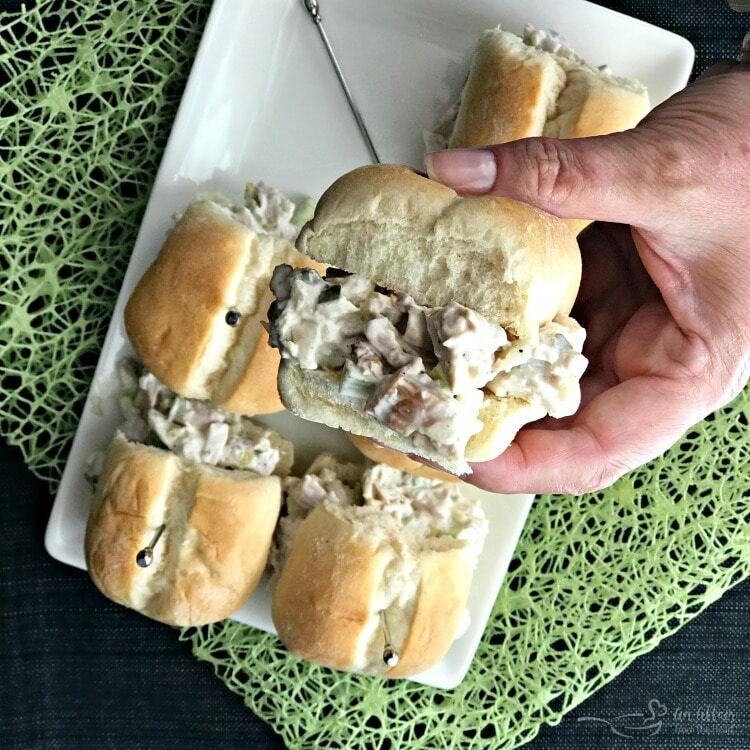 Turkey Salad Sliders are so simple to make using just a couple of ingredients and your leftover turkey. Perfect for game day or a light lunch. Two weeks from today is Thanksgiving. Can you believe that? It’s true what they say about getting older, the months (the YEARS) just whip on by. I feel like it was just last Spring and we were begging for winter to finally end and for the weather to warm up, and here we are, November again and today snow flakes fell from the sky. Nothing against Thanksgiving, I actually really like it. Just not ready for the cold. What’s not to like about Thanksgiving? Lots of good food, good wine and family time. Plus — pie. Mmmm. The next best thing to Thanksgiving? Thanksgiving LEFTOVERS! There is nothing like making a nice big turkey sandwich when you come home from black Friday shopping, or warming up some mashed potatoes and stuffing with a nice pour of gravy. Plus — pie. Mmmm pie. So I thought maybe you might like to have some uses for those leftovers? I mean, if they last past Friday morning? I love a good chicken salad, don’t you? Everyone makes it differently. Some use grapes, some water chestnuts, dill, mayo, no mayo — there are so many options. I like mine pretty simple, and it’s easily adaptable for using leftover turkey! Sure, you could serve it up on a piece of bread or toast, but I thought, what about using slider buns? I don’t know about your house, but here? The only thing more predictable than Turkey on Thanksgiving is football. These Turkey Salad Sliders would make for great football watching eats! 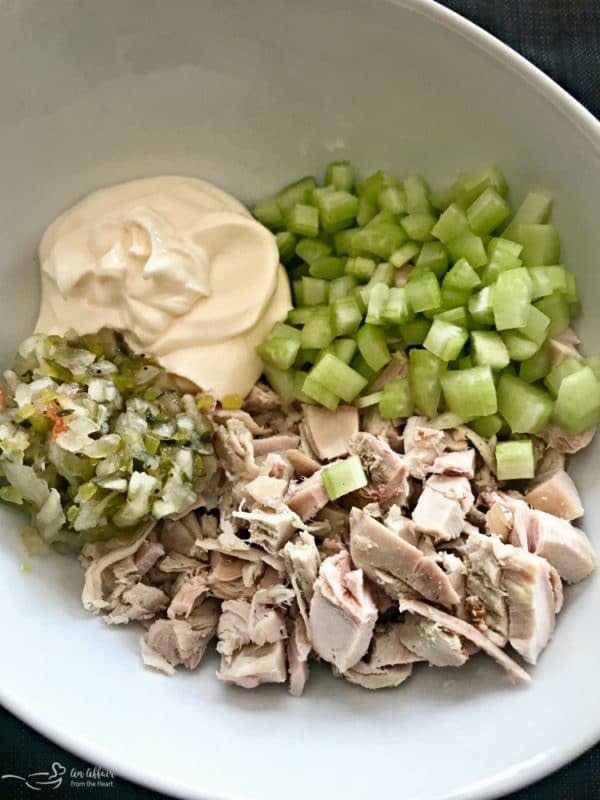 Aside from salt & pepper, the only ingredients I use are turkey, mayo, celery and chopped sweet pickle. (or pickle relish) . Mix it up and you’re good to go! I got to thinking about what my family considers a traditional Thanksgiving meal. My Mom makes the exact same meal every year, and I wouldn’t have it any other way! When everyone gets there, she always has a huge relish tray, full of all sorts of fresh veggies and her veggie dip that everyone loves. Typically we have a meat and cheese tray, too. Everyone snacks and has a glass of wine while they wait ever so patiently for the main course. 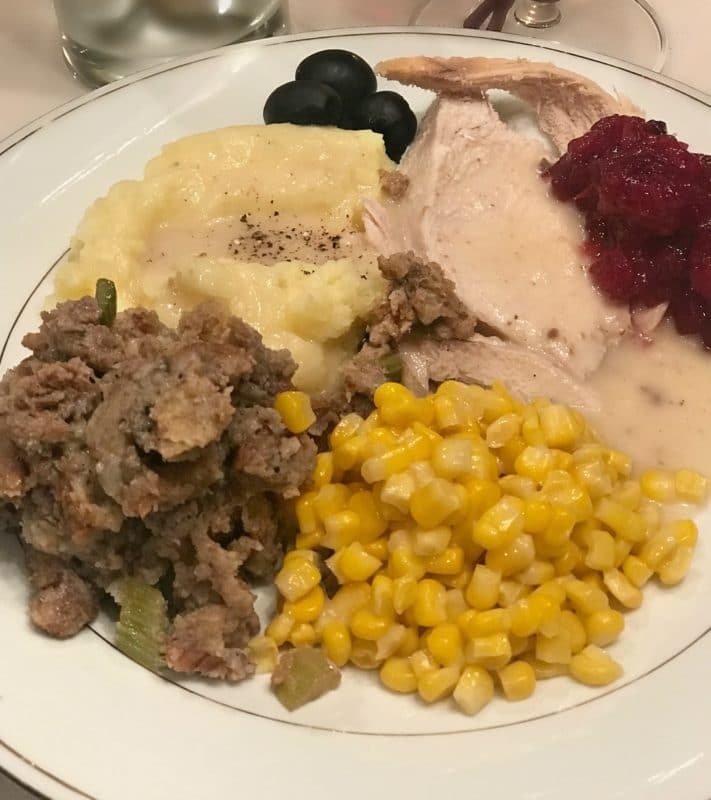 A picture of my plate from last year’s Thanksgiving dinner. Her turkey always turns out perfect. Roasted golden brown and stuffed with my Grandma’s Sausage & Sage Dressing that is, hands down, my favorite part of the meal. There are mashed potatoes and turkey gravy, (which is my job to make) corn, her cranberry sauce, that I love. It has orange in it, and it’s perfect in every way. Of course, there are rolls, and I always make the pies. I do pumpkin, pecan pie and an apple. Always topped with fresh whipped cream. After dinner we browse the ads, and let our tummies settle into blissfulness. The leftovers are evenly divided, and home we go. But what if instead of just eating the leftovers the way they came home, we repurposed them? 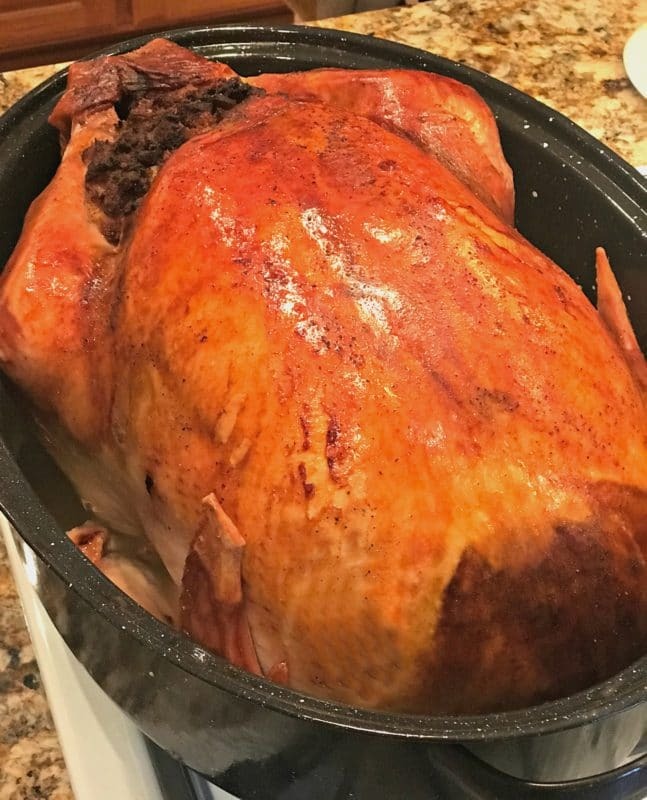 I have some amazing ideas and recipes for you to use all sorts of things that could be left over from Thanksgiving, or any holiday where you have turkey and the trimmings. A photo of my Mom’s big bird from last year! She makes the best turkey! I think it’s only fair to start with the food everyone associates with Thanksgiving, Turkey! Chicken (or Turkey) Ala King – Super easy recipe for Chicken (or Turkey) Ala King – using left over meat and frozen veggies. Serve over biscuits, noodles or baked potatoes! Chicken (or Turkey) Tortilla Soup – Lemon Blossoms — This healthy, flavorful, easy to make soup is a complete meal. Especially if you add all the amazing toppings! 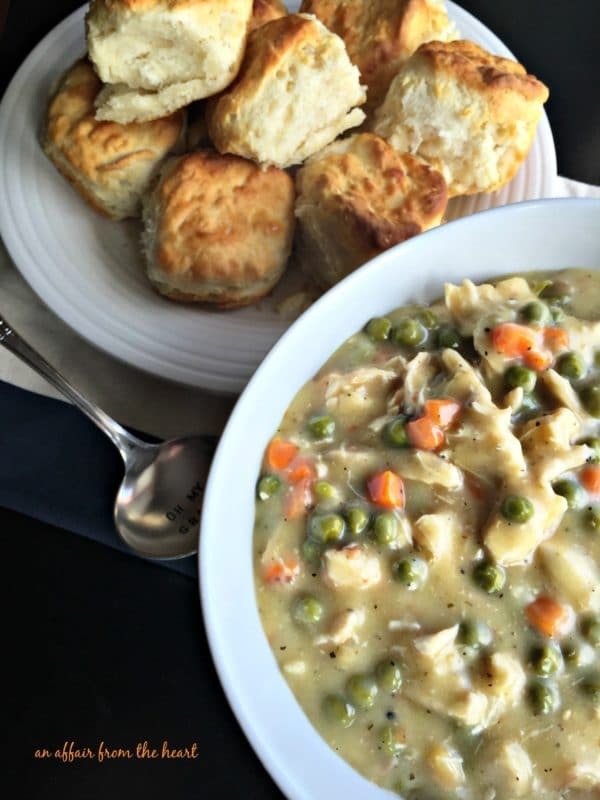 Turkey Pot Pie with Biscuit Topping– Lemon Blossoms — Chunks of turkey and vegetables are baked in a creamy, rich and savory sauce and topped with a golden biscuit crust. Roast Turkey Tater Tot Casserole – Lisa’s Dinnertime Dish — A delicious twist on a comfort food classic, using leftover turkey. Easy Turkey Tetrazzini – West Via Midwest –made with a cheesy sauce, earthy mushrooms with noodles, this turkey casserole is a great way to eat leftover turkey! Smoked Chicken (Turkey) and Grapes Hand Pies – Take Two Tapas — Great light lunch, appetizer or tailgate food! Turkey and Roasted Sweet Potato Risotto – Lisa’s Dinnertime Dish — A creamy risotto with sweet potatoes and leftover turkey. Whether you have mashed potatoes or sweet potatoes, or both, chances are you might have some leftovers. Make them into something new! 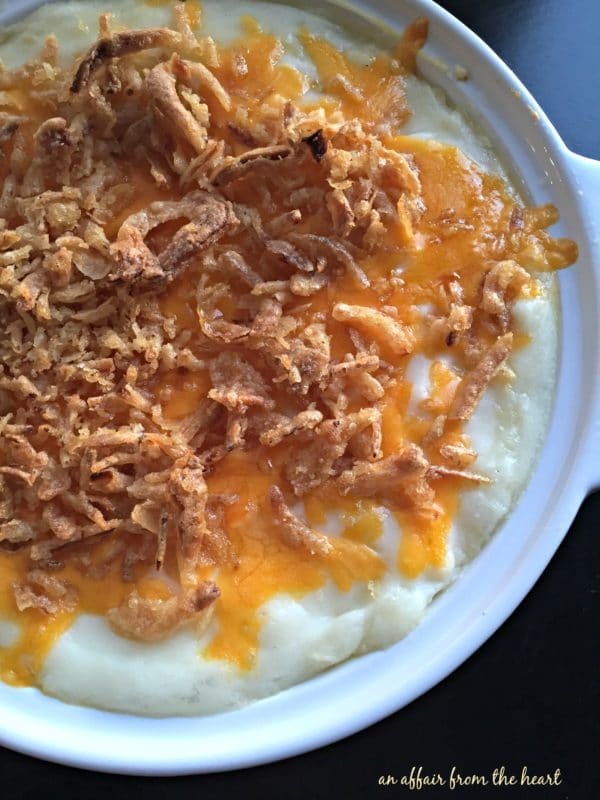 Bake our leftover mashed potatoes with cheese and french fried onions! Baked Mashed Potatoes – Baked with cheese and French fried onions. Sweet Potato Bisque with Truffle Oil – Lisa’s Dinnertime Dish — Sweet potatoes combine with earthy truffle oil and buttery, crunchy homemade croutons to create this scrumptious sweet potato bisque. Southwest Potato Croquettes – Take Two Tapas — Mashed potatoes mixed with Southwest seasoning and fried into perfect little dipable appetizers. Loaded Mashed Potatoes – Dress up mashed potatoes like a loaded baked potato, baked in the oven. Great with BBQ! My most FAVORITE part of the whole meal is my Grandma’s Sausage and Sage Stuffing. We always called it Dressing! Honestly, the leftover stuffing is typically fought over in my family. Its disappearance from the fridge has been a source of many arguments. 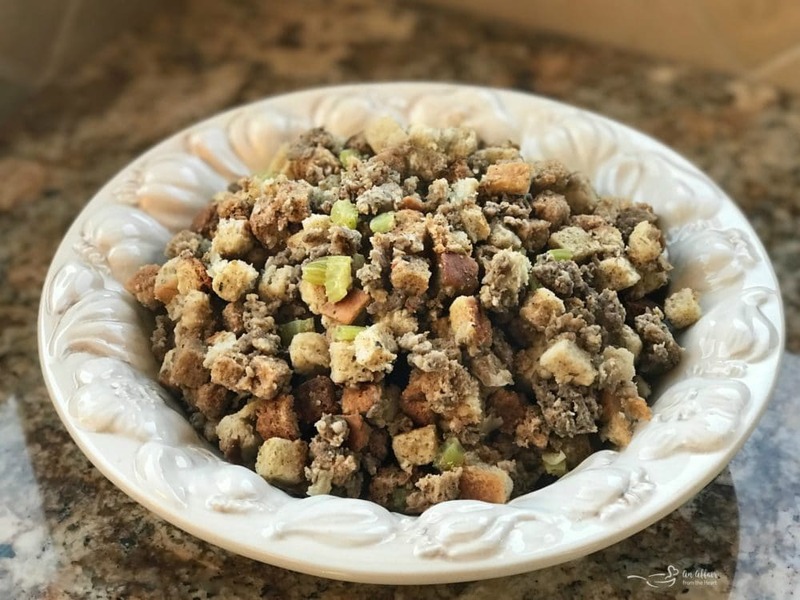 BUT if you have leftover stuffing, or as we call it, Dressing, there are some great uses for it, too! Deep Fried Cornbread Dressing Balls – Take Two Tapas — Deep Fried Cornbread Dressing Balls with Cranberry Dip are perfect appetizer made from leftover stuffing. Sourdough Stuffing Egg Casserole – Lisa’s Dinnertime Dish — put your leftover to good use and make this sourdough stuffing egg casserole. Stuffing adds incredible flavor to this brunch dish and it comes together with so little effort. Leftover Stuffing Bacon Cups – West Via Midwest – will use up all your leftover stuffing! Make bacon cups, spoon the stuffing in, top with some cranberries and nuts and you have a delicious bite sized snack! 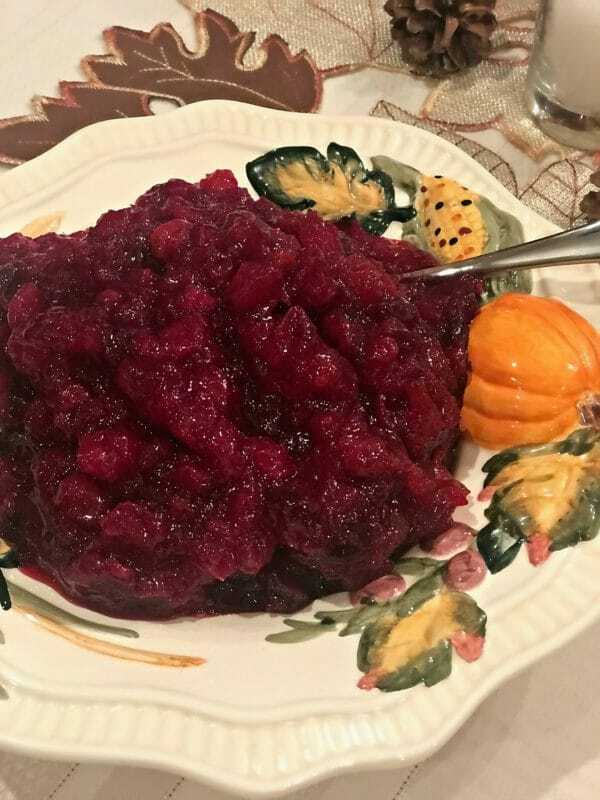 My Mom’s Cranberry Sauce – made with hints of orange. Sugared Cranberries – Tart cranberries, bathed in sugar syrup, then dusted in sparkling sugar. Tasty and a beautiful garnish. 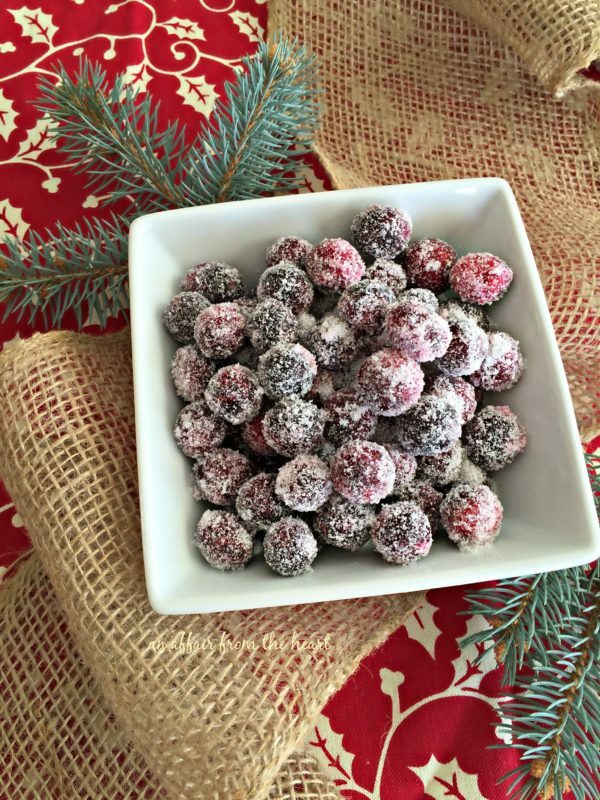 Sugared Cranberries – Pictured Above, these little bites make a great snack and also a wonderful addition to cheese and charcuterie boards. Cranberry Centerpiece – Not a recipe, but an easy centerpiece made with fresh cranberries. Cranberry Orange Christmas Pound Cake – Lisa’s Dinnertime Dish — Freeze your leftover cranberry sauce and make this delicious pound cake for Christmas. Baked Brie with Cranberries – Lemon Blossoms — Puff pastry surrounds baked brie and cranberries in this impressive holiday appetizer. Honey Roasted Cranberry Ricotta Crostini – Take Two Tapas — Drizzled on top of a creamy bed of orange flecked ricotta cheese on a crispy baguette, a festive crostini appetizer for any party! Roasted Cranberry Bourbon Crush – Take Two Tapas — cranberries paired with tart cranberry juice, caramel hinted bourbon and bubbly lemon-lime soda. After the pecan pie is devoured, you have so many ways to use those leftover pecans! 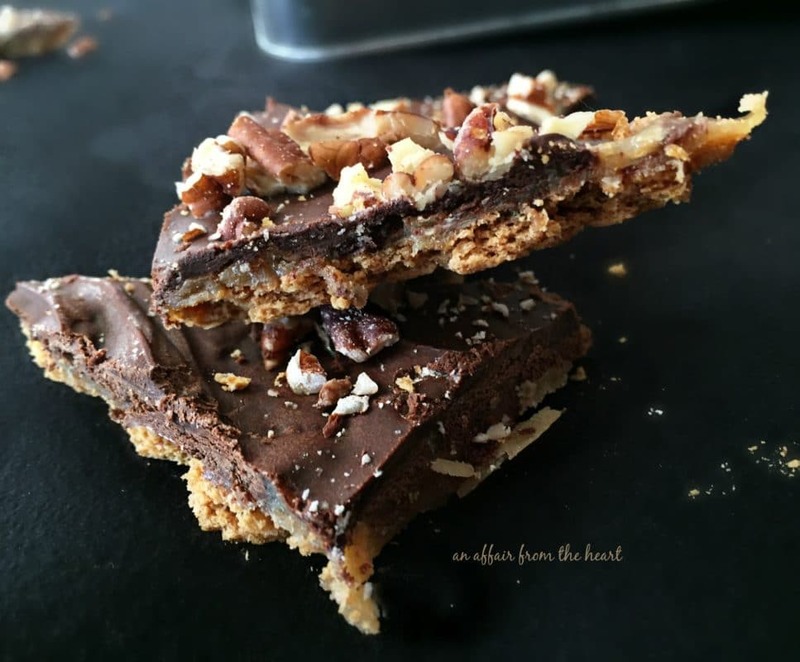 Graham Cracker Toffee – Pictured above, this toffee is so easy to make and is one of the first things to disappear off of my holiday treat trays. Perfect for that cookie exchange you have coming up! Caramel Toffee & Pecan Fudge – Sweet toffee fudge made with caramel and pecans, perfect for your holiday baking list! Toasted Pecans – Take Two Tapas — make perfect buttery toasted pecans, or any other type of nuts, to use in a variety of recipes and dishes. Sugared Pecans – Make these for using on cheese boards, or wrap them as hostess gifts. The pumpkin pie is but a memory, but you hate to throw away that pumpkin puree. Don’t waste it, re-purpose it! 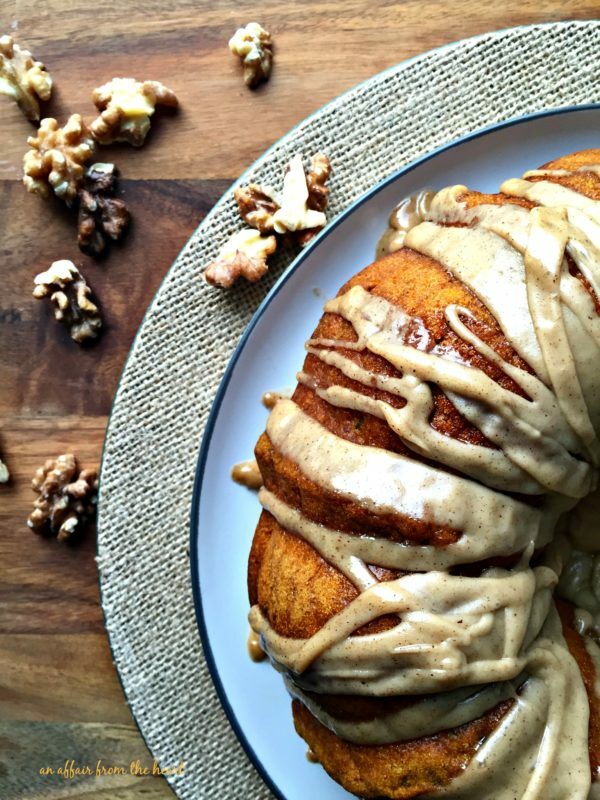 Pumpkin Spiced Coffee Cake with Brown Butter Glaze – Quite possibly the best way to breakfast. Pumpkin Pie Croissant Bundles – Easy to make croissants filled with cream cheese, pumpkin and fall spices. Lower calorie recipe that doesn’t require sugar, to keep calories down and you able to eat the fall flavors you love! Chocolate Pumpkin Wontons – Take Two Tapas –crispy chocolate pumpkin wontons are filled with creamy pumpkin pie, sweet chocolate, topped with a maple sour cream glaze, and dusted with powdered sugar! Mini Spice Cookies with Pumpkin Dip -Soft and chewy spice cookies surround a bowl of pumpkin dip — perfect for entertaining. Mmmmm Pie. My favorite of all the desserts. But my grandma always taught me to have extra pie crust on hand, even if it’s just for sprinkling cinnamon and sugar on. Get a little more creative with these recipes. 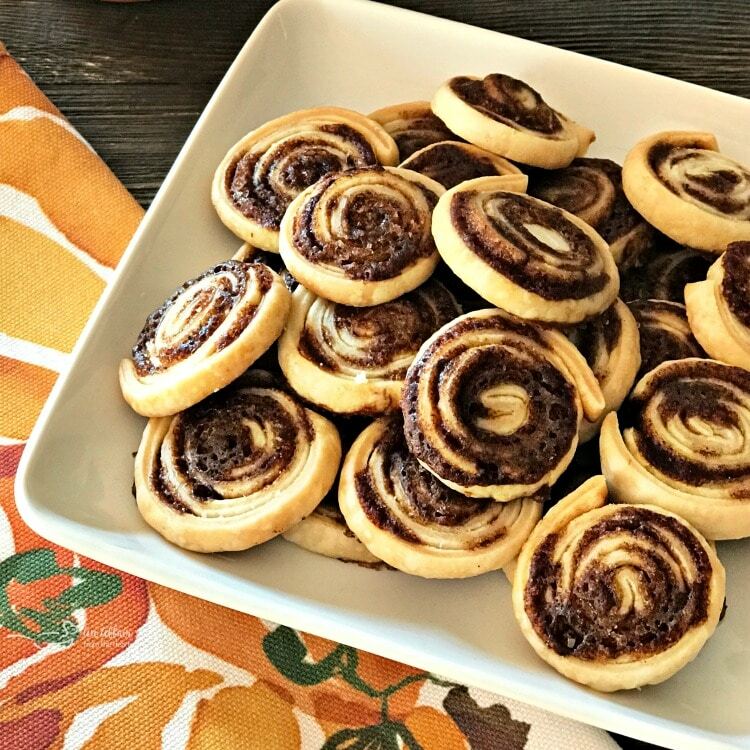 Pumpkin Spice Swirls – Leftover Pie Crust Cookies – Pictured above, these little bites are great to have with your favorite cuppa. Dairy Queen Apple Pie Blizzard – Copy Cat Dairy Queen Apple Pie Blizzard is made with spiced apples, vanilla ice cream and cinnamon pie crust. Pie Crust Cookies – Pie crust cut with cookie cutters and dusted with flavored sugar. Pie Crust Cookies with Pecans and Whiskey Caramel Sauce – Take Two Tapas — pie crust is transformed into easy pie crust cookies topped with a pecan and drizzled with a whiskey caramel sauce! So many options!! 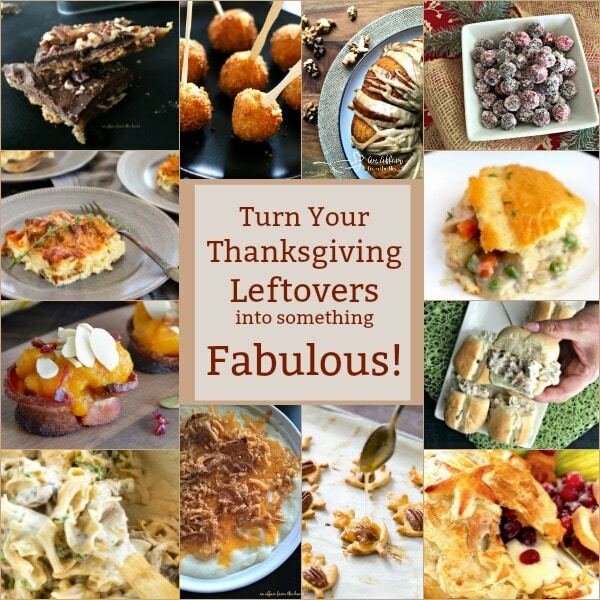 I hope that you find a couple that will turn YOUR leftovers into something fabulous! If you do, I’d love to hear all about it! What do you say we get back to the Turkey Salad Sliders? Quick and easy Turkey Salad Recipe — coming up! Spoon onto slider buns. Serve. These sliders look so good! They’d be perfect for to serve for lunch the next day if you have out of town guests staying with you! While I love having everyone over to watch the games after Turkey Day, I hate having to make all new dishes to serve. These turkey sliders use up the leftovers while making it into a new dish that is perfect for game day! 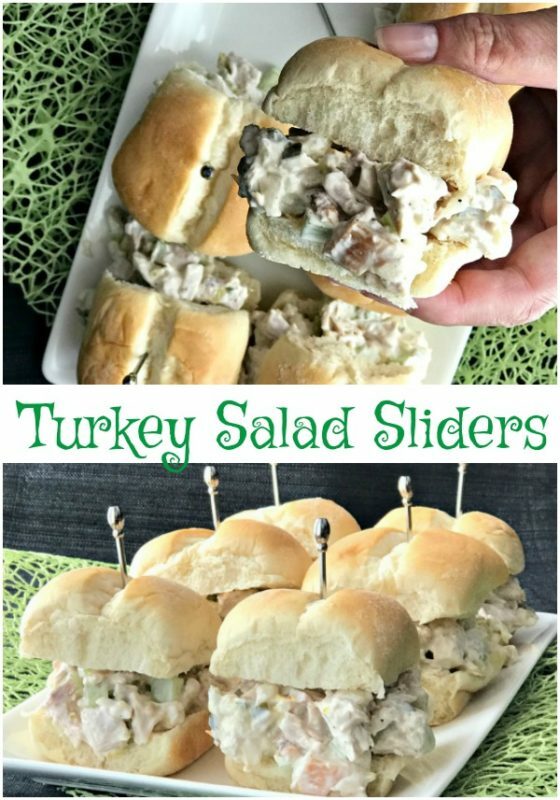 I love the Turkey Salad slider idea! So perfect for watching the game or for a tasty lunch! Thank you for all the wonderful leftover recipe ideas! So many good options. This is a really good twist on a turkey salad. Would love to have them for lunch! So many awesome ideas for thanksgiving and thanksgiving leftovers! I’m sure my family will be taking full advantage of these ideas! What a great idea! 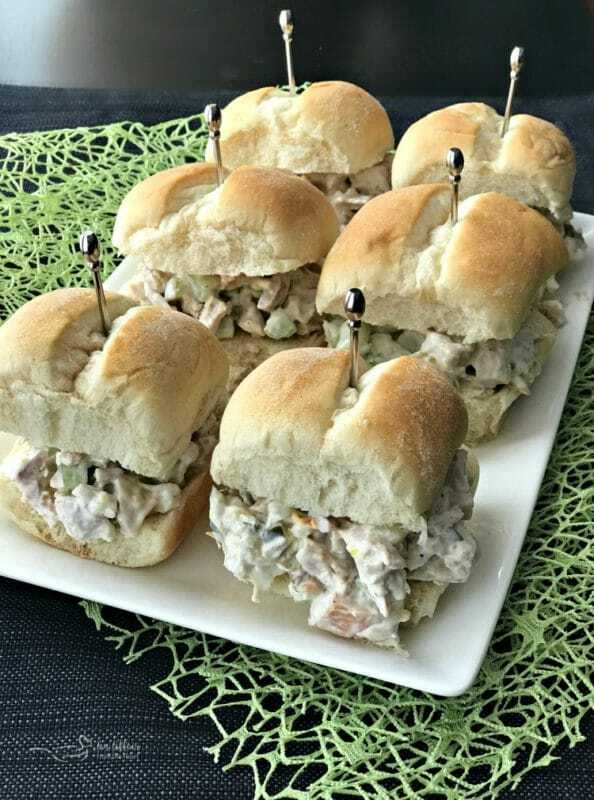 Turkey salad sliders sound fantastic. I appreciate all the other ideas too. Have a Happy Thanksgiving! Fellow food blogger here — and we are making a “holiday bird” tomorrow — so I’ll definitely be making your turkey sliders by Sunday! Can’t wait! I love chicken salad, I can’t believe I never thought to make turkey salad! Sounds so good! 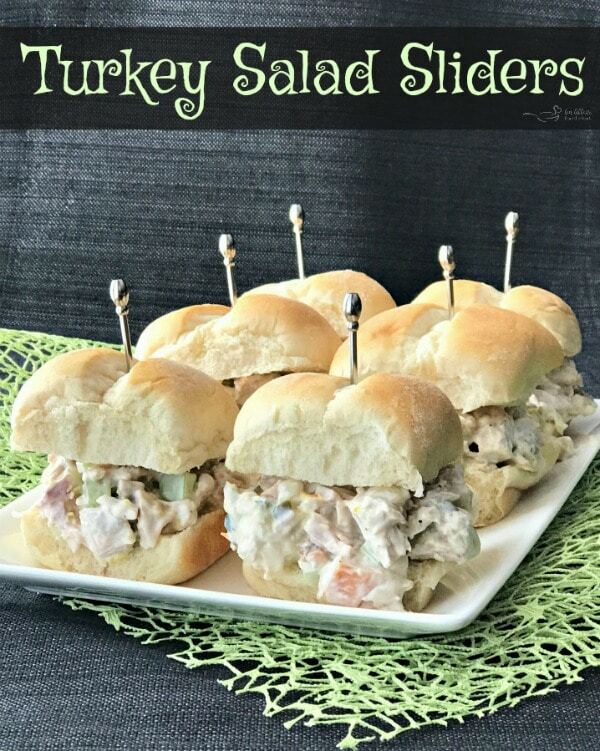 Those turkey salad sliders look delicious. I could devour one right now! Love all the recipes for using leftovers! Such a useful post. Going to pin it for later! I love simple recipes with leftovers like these sliders.. And I love all your ideas for leftovers. Definitely saving this for post Thanksgiving weekend!! Yum! Now this is my favorite light lunch recipe. This recipe looks super easy and full of ingredients my family loves. Looking forward to trying soon. Leftovers or not, these look delicious. Great for game day too! I know its not Thanksgiving yet, but I had a small turkey breast leftover and I whipped up these sliders for the game yesterday. They were great! Everyone was so excited to have something a little different for a game day snack! Definitely going to make these again come thanksgiving!